New Stovetop Stories on Wednesday! It’s been a while! I was actually on a trip to Nashville last week, so I didn’t get the chance to post recipes. Mark your calendars though, because I’ll be back with plenty of new Stovetop stories for you on Wednesday! Bread is my guilty pleasure. I grew up eating baguettes every morning and I can’t picture my day starting otherwise. 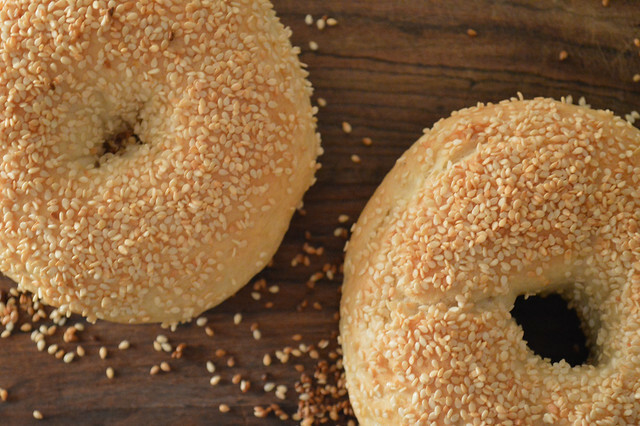 Yet, I was introduced to real NY-style bagels when I moved to the US. When my roommate brought me to Ess-a-Bagel, in Manhattan, a whole new world opened up! These beautiful balls of dough were perfectly chewy outside and fluffy inside. I got the classic sliced lox and cream cheese and I have to admit that it was as good as my usual baguette. Now that I’m home in Philadelphia, I tried a homemade version of these babies and it turned out great! Bon appétit! Mix 1/2 the water, the yeast and the white sugar and let it sit for 5 minutes. Then stir it well together. In a large bowl, mix the flour and salt, make a well, and pour the yeast mixture and the rest of the water in it. Knead the dough on a floured countertop for about 5 minutes. Slightly coat the dough with oil and let it rise in a bowl for about 60min, covered with a damp towel. Separate the dough in 4 pieces and turn them in round balls. Make a hole in the middle of each one with your thumb. 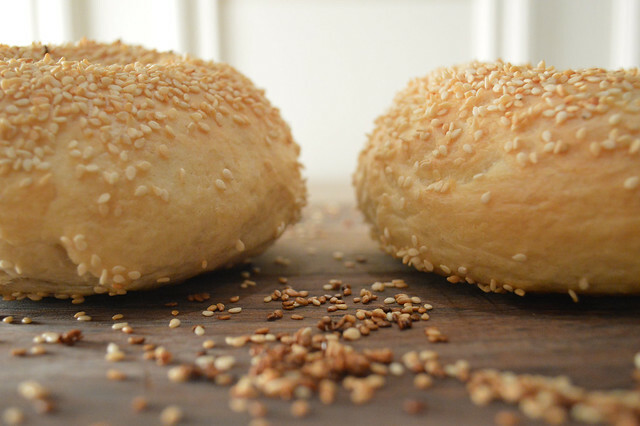 Again, cover the bagels with a damp towel. Preheat your oven to 425°F. 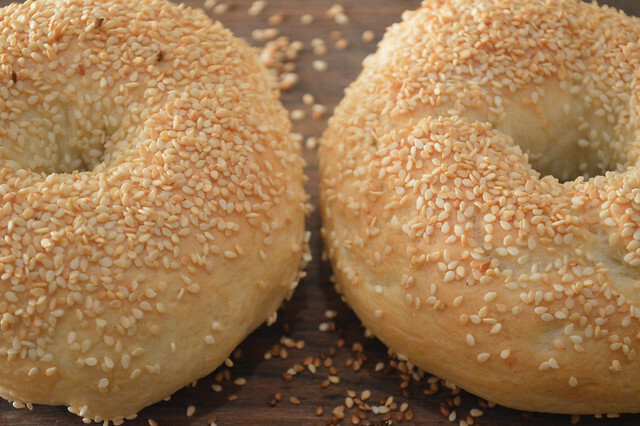 Bring water to a boil and put each bagel in the boiling water for 1 minute per side. Sprinkle with your choice of topping right away and bake for 20 minutes on a greased baking sheet. TIP: you can then make whatever sandwiches you prefer, I love sliced lox and cream cheese, or bacon egg and cheese! This is just to let you know that I’ll be away for a (well deserved!) spring break this week. Therefore I won’t post on Stovetop, but I’ll be back with more amazing recipes on March 17th!!! So you can mark the date in you calendars, and come hungry in a week! Also thank you all for the support, it’s been such a great adventure so far and it wouldn’t be the same without you!